Because they know how important a good night’s sleep is, our good friends in Cascade Designs, Midleton, County Cork have given us a great Therm-A-Rest Neoair Venture self inflating mattress to giveaway to one lucky winner. In 1971, Jim Lea, Neil Anderson and John Burroughs wanted to make the most of the outdoors and created the world’s first self-inflating air mattress. Today, Therm-a-Rest remains at the forefront of comfort innovation and quality. From protection and warmth on a night camping, to a seat that turns a rocky outcrop into an amazing lunch stop, the right dose of comfort means that the better you rest, the better you play. For our thermarest giveaway, we have a Neoair Venture regular mattress wortyh €79.99 to handover to one lucky winner. 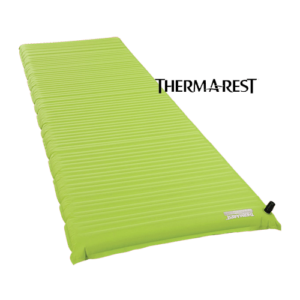 For your chance to win this great self inflating mattress, check out our Thermarest Giveaway below and answer a simple multiple chice question. The following are the terms and conditions of the Great Outdoors Therm-A-Rest Giveaway 2017. Your participation in the competition shall be deemed to be your complete acceptance of the terms and conditions herein. •All entrants will have their email address added to our mailing list and that of Therm-A-Rest. To unsubscribe in the future, simply use the unsubscribe link in any of the emails you receive. •Entrants can enter as often as they like but their will only be one prize per entrant. •The prize is neither transferable nor exchangeable and cannot be exchanged for money. •The winner will be notified via email and prizes must be collected in-store within 30 days of their entry or the prize will be considered forfeit and used in an alternative competition in the future. •By entering the competition,each entrant unreservedly agrees to these terms and conditions which govern the competition and the awarding of the prize. •By entering the competition each entrant agrees to release, discharge and hold harmless the Great Outdoors, their legal representatives, affiliates, subsidiaries, agencies and their respective officers, directors, employees and agents from any damages whatsoever suffered, sustained or allegedly sustained in connection with the competition or the acceptance of the prize. •Great Outdoors reserves the right to alter these terms and conditions at any time and at their sole discretion. •The winner will be chosen at random from all those who answer the qualifying question correctly. •The winner’s name will be disclosed to anyone who writes to the Great Outdoors at their physical addresses. •The winners will be announced via social media channels on Friday, August 4th. •Closing date for all applications is midnight on Thursday August 3rd 2017. •Specification of prize may vary. Images used for illustrative purposes only.